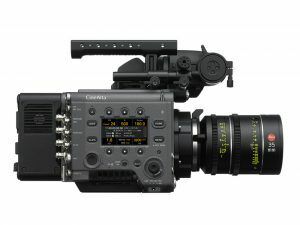 Replacing the aging PMW-F55 and F65, the new Flagship VENICE is Sony’s first dedicated Full-Frame digital motion picture camera system and features a 36mm x 24mm full-frame sensor which Sony says was “designed specifically for the demands and performance of high-end cinematography” capable of capturing images up to a maximum resolution of 6048 x 4032*. Switch imager modes and the camera can also natively support Super35 24.9mm x 18.7mm, 4096 x 3024 resolution as well as Super35 24.9 mm x 14.0mm 4096 x 2160 resolution. Utilizing a full-frame sensor also gives the VENICE the ability to capture images in almost any format, including 18mm-height Super35 Anamorphic and spherical and/or full-frame 24mm-height Anamorphic and spherical*. *Firmware update required and licenses will be available to expand the camera’s capabilities with new features including 4K anamorphic and full-frame as shown in table below. 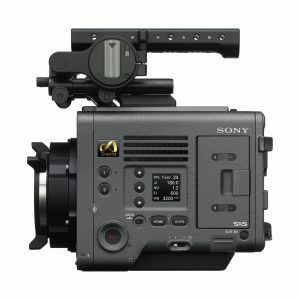 Sony is obviously thinking of long term usability and has designed the VENICE to be fully modular allowing for easy upgrading as technology advances. Probably the biggest benefit of this design is the is user interchangeable sensor which can be swapped out easily by removing the 4 screws that hold it in place. Because the VENICE has the same bottom to optical centre of the lens mount as the F55, base plates and other accessories for the F55 can also be used to the VENICE. The VENICE features a native breech-lock E-mount but also ships with an industry-standard PL lens mount that is compatible with all Super35 and full-frame PL lenses, both spherical and anamorphic. 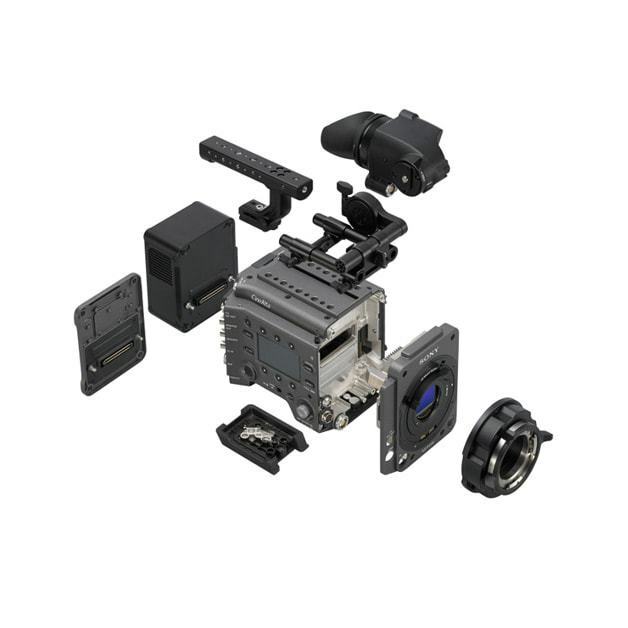 The PL mount fits right over the native E-mount and also features contacts that support Cooke/iTechnology which records lens information frame by frame as metadata. 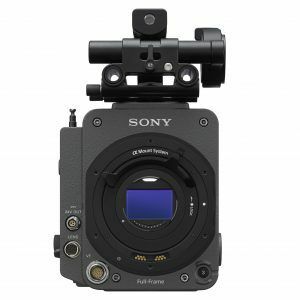 The VENICE also features what Sony is claiming is the world’s first (in its class), servo-controlled 8-step mechanical ND filters offering ND of 0.3 (1/2 = 1 stop) to ND 2.4 (1/256 = 8 stops) range. User controls are located on both sides of the camera with an OLED display for assistants on the outer side and operator controls and mini OLED display located on the inner side. The camera operator panel gives access to commonly used features such as the aforementioned ND filter as well as shutter FPS, white balance and exposure. The robust main display/control panel provides fast access to all camera settings by an assistant while filming. 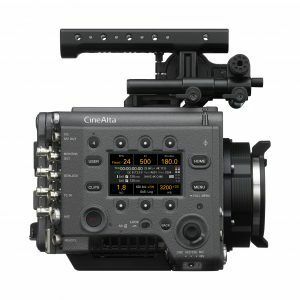 Due to it’s surprisingly small size (for a cinema camera), the VENICE can be easily mounted on to an aerial imaging platform which is pretty much a requirement on a lot of film production sets these days. It also allows for easier. more comfortable shooting in tight spaces. Another important physical feature is that the ventilation system is completely isolated from all electronic components keeping them dust and splash free. VENICE supports internal recording of MPEG HD (fixed FPS only) and HD ProRes Proxy in XAVC 4K and XAVC QFHD onto SxS media. With the optional AXS-R7 recorder attached, it supports both RAW and X-OCN recording of MPEG HD (fixed FPS only), HD ProRes, XAVC 4K and XAVC QFHD onto SxS media.